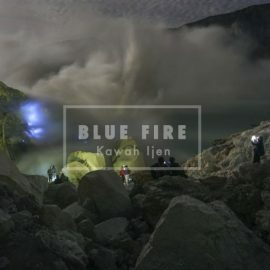 Blue flames and the largest highly acidic lake in the world. degrees Celsius (1,112 degrees Fahrenheit). Those gases are directly originated from the magmatic chamber under the volcano. The flames can be up to 5 metres high; some of the gas condenses to liquid and is still ignited. 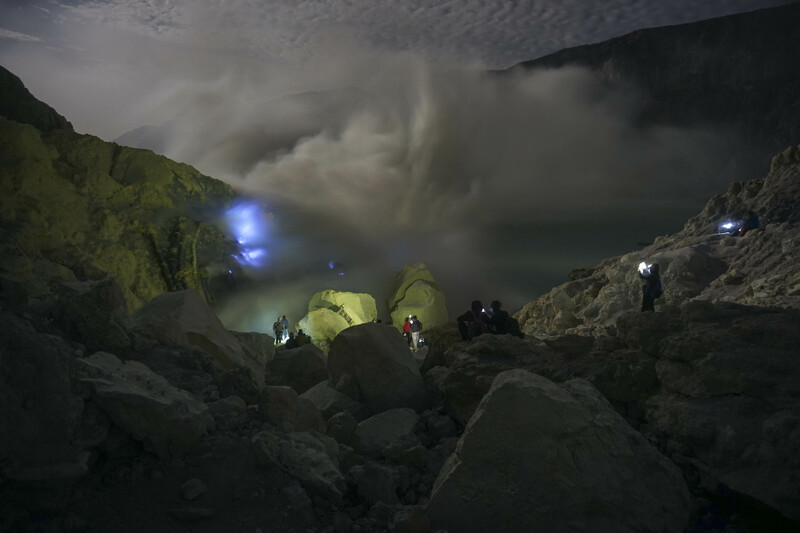 It is the largest blue flame area in the world and one of the purest sulfur mine. Escaping volcanic gases are channelled through a network of ceramic pipes, resulting in condensation of molten sulfur. The sulphur, which is deep red in colour when molten, pours slowly from the ends of these pipes and pools on the ground, turning bright yellow as it cools. The miners break the cooled material into large pieces and carry it away in baskets. Miners carry loads ranging from 75 kilograms to 90 kilograms, up 300 metres to the crater rim, with a gradient of 45 to 60 degrees and Most miners make this journey twice a day.